Working as part of the Customer Success team for almost three years, some of the top questions which arise are ‘how do I assign another team member a task’ or ‘can I be notified about a project’ – well it’s easy! In today’s post, we’ll demonstrate how you can stay connected with your team members by looking at an example of a typical team’s organizational inside sales workflow. Take a marketing services agency ‘’Make it happen promotions” who are rapidly growing in both sales and staff. Keeping all team members in the loop is vital to ensuring tasks are completed and deadlines are met, which in this industry, leads to repeat business. Meet Jen (virtually). She’s the initial point of contact for introducing the business to the outside world. As head of business development, her first task is to find leads. 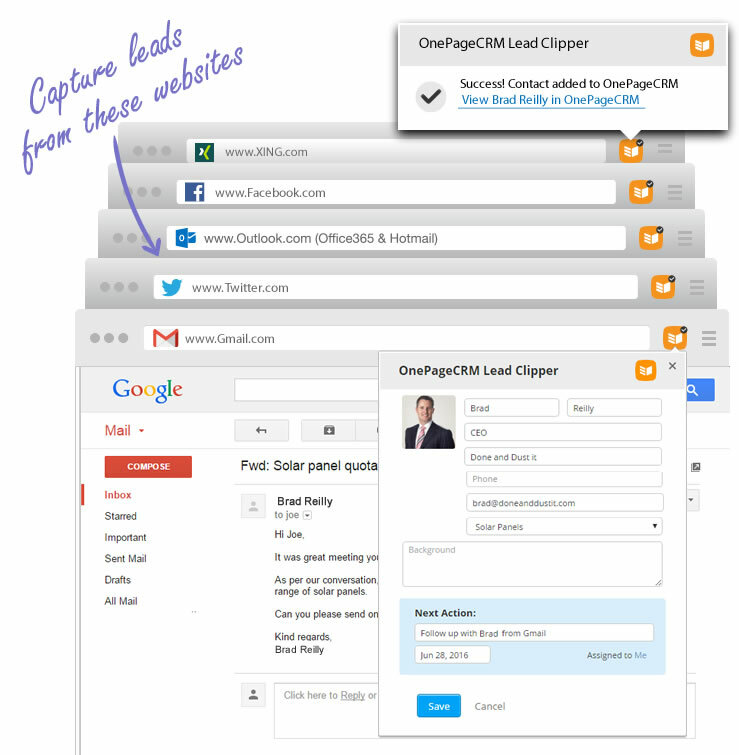 Using the OnePageCRM Lead Clipper, Jen can quickly create a lead in OnePageCRM (in one click) along with a next action to kickstart the sales process. Now the nurturing really begins. Once the lead, Brad, is added to OnePageCRM, it is automatically added to a MailChimp campaign for initial engagement and for further qualification. At this stage Jen is aiming to convert Brad from being a cold lead to a qualified lead. Once Brad reacts (in this case positively) by replying to the email, it’s now time to further build the relationship using of course a series of touchpoints called Next Actions. By continuing to set one next action at a time, Jen is nudging closer to closing the deal with Brad. Jen’s work is done once the order has been placed. What to do next? Assign a next action to her project manager Liz to follow up with the logistics team and an estimated time of arrival. Liz uses a Project management tool called Trello to ensure the relevant steps are carried out. She can connect this with OnePageCRM using Zapier. To ensure Liz is kept in the loop, Jen also notifies her of the latest note she added with full details of the order. (Jen can do this directly from within the system, she doesn’t need to create a separate email thread with Liz). On dispatch of the product, Liz assigns the follow up to Rob. Rob is part of the accounts team. One of the most critical parts of the process is ensuring each customer gets invoiced. Rob can do this using Accounting app Xero. He doesn’t have to recreate the contact again and he can create a draft invoice over in Xero right from within OnePageCRM. 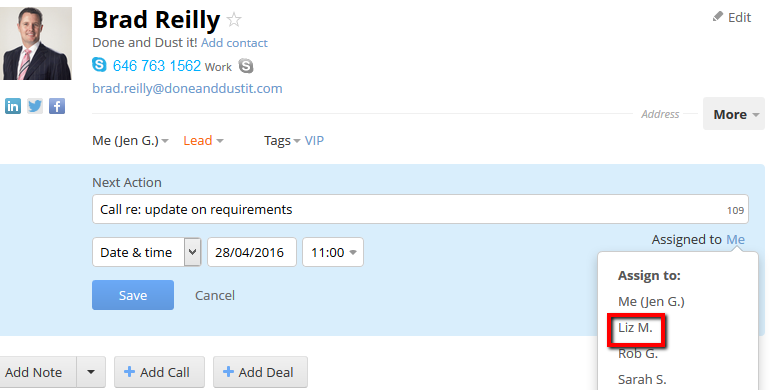 Success – Invoice sent! Now it’s time to assign ownership of the contact to Sarah who’s the account manager. Sarah will be the principal point of contact from here. This is the final stage in the process for this customer (for this job). 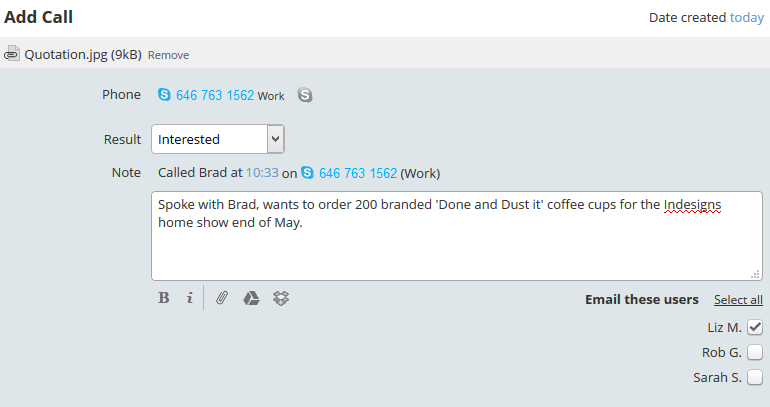 Under the Activity Summary, Sarah can quickly see all the previous notes, deals and any email correspondence sent to Brad. This keeps the relationship open and growing, leading to more repeat business. By using OnePageCRM’s team collaboration features, it ensures the relevant key point people are notified when required. 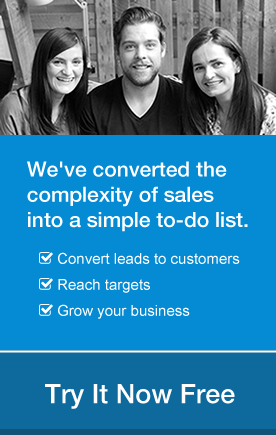 Ultimately, leading to smoother communication and more sales. 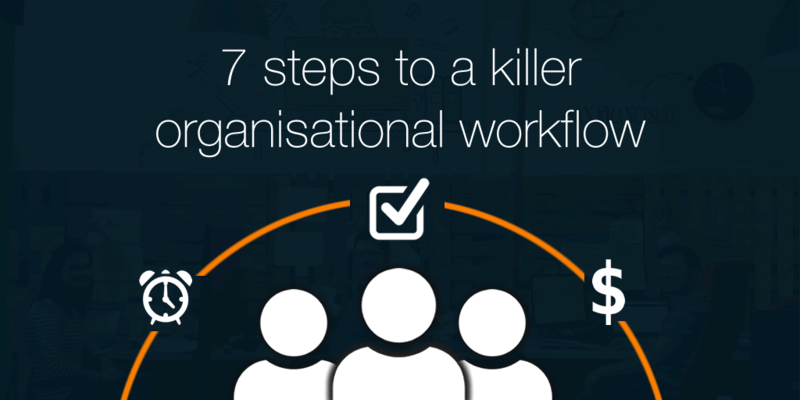 Check out the above organizational workflow for your business. Let us know if it helps you not only improve communication among your team but also increase sales!